Discussion in 'Online Games - News and Reviews' started by Marina, Feb 4, 2019. Whenever an online casino software group launches a new series of slot games, it’s always the players that benefit big time. It means that the group is serious about creating a unit of games to keep its players entertained, and there is always something new to look forward to. Our latest news is about a new slots series release that comes from the innovative Big Time Gaming group, which announced the rollout of the new Holy Diver slot game. You may recognize the title of the new game as the name of the debut studio album of the American heavy metal band, Dio which was released in 1983. You will find the connection within the free spins feature. 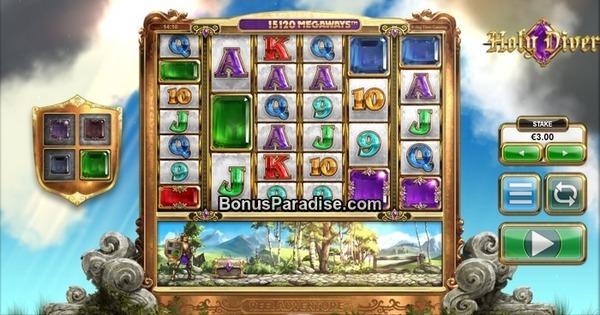 Big Time Gaming’s Holy Diver slot is the first game which boasts the group’s Reel Adventure mechanics. There are so many ways to win thanks to the 6-reel engine, which also makes it a unique gaming experience for players. The 6-reel structure, unique to the Reel Adventure series, allows for more winning potential overall. BTG has done a lot of work to make this an interesting slot game to play, beginning with its Dark Ages theme and superb look. They also made this one of its most wager-friendly games which will come as good news to players. We are enamored with the bonus features in this slot game. One of our favorites must be the animated Knight which rides along a path below the reel set. When he comes across a Treasure Chest (which happens regularly throughout the game), he gives it a kick to reveal one of four reel modifiers. A low-value symbol can turn into a wild; it can trigger the Sword Bonus with up to three full wild reels and a multiplier of up to 7 times; it can trigger the Fireball Bonus which adds up to four wild symbols to the reels; or it can trigger the Gem Symbol Bonus which awards Gem symbols and multipliers of up to 3 times. The Shield of Fortune feature has you collect four gems of each color to trigger the bonus. Choose at which level you want to activate the bonus level (up to three levels) and win free spins and multipliers along the way. If you choose to activate the free spins, you will finally come across the Holy Diver heavy metal connection. Win up to 10 free spins and multipliers of up to 3 x depending on your play level. Look out for the new slot game at LeoVegas Casino right now and at other BTG-powered casinos from February 7th 2019. This is really a fantastic video slot! I really enjoy it!